So Far Not So Bad As Storms Head East, But Threat Remains : The Two-Way A massive storm system moved through the upper Midwest on Wednesday and early Thursday. Now it's bearing down on the Mid-Atlantic. It hasn't been as severe as feared, but is still bringing high winds, hard rain and some hail. Quite a show in Chicago: Lightning struck the Willis Tower (formerly the Sears Tower, at right) on Wednesday as the storm system moved through. The good news is that "a massive storm system originally forecast to affect one in five Americans from Iowa to Maryland surged Thursday toward the Mid-Atlantic after largely failing to live up to its billing in ferocity through the Upper Midwest." The bad news, The Associated Press adds, is that "while the Midwest dodged a derecho, several tornadoes, large hail and flooding did some damage." And "for Washington, Philadelphia and parts of the Mid-Atlantic the big storm risk continues and even increases a bit Thursday." "Ongoing severe weather Wednesday night will continue moving east from the Ohio Valley into the Mid-Atlantic on Thursday. The Storm Prediction Center continues a Moderate Risk tonight for the Mid-Atlantic for large hail, damaging winds and tornadoes. An area of Slight Risk surrounds it along most of the East Coast." The D-word (derecho) seems to have been taken out of the equation, thankfully. The AP notes that some meteorologists had "warned about the possibility of a weather event called a derecho (deh-RAY'-choh), which is a storm of strong straight-line winds spanning at least 240 miles." 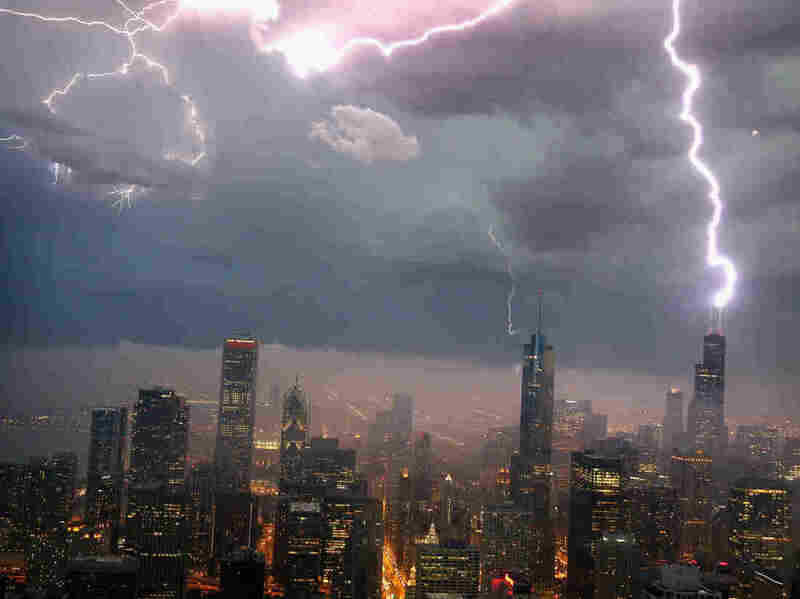 And it reminds us that "last year, a derecho caused at least $1 billion in damage from Chicago to Washington, killing 13 people and leaving more than 4 million people without power." But, the AP says, "by early Thursday, a derecho hadn't developed. And Greg Carbin of the National Weather Service's Storm Prediction Center in Norman, Okla., said, 'With each hour that goes by, it's less likely.' "
Of course, even a storm that's only "severe" instead of catastrophic can be serious. So it makes sense to stay alert if you're among the millions in the path of such a storm. The Weather Channel is tracking Thursday's storms here.